This is the first time I experiment with tofu. I tried many times finding it in grocery stores like Walmart and Kroger, but never found it. Few days back I found it in the vegetable section at Walmart and with out a anther thought I just grabbed two packets. I recommend you use extra firm tofu for this preparation. Heat oil in a skillet and add mustard seeds, cumin seeds, urad dal and Chana dal. 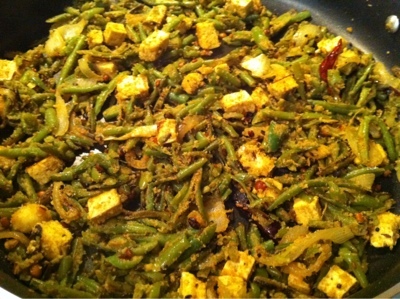 When they turn golden brown add green chili, onion and curry leaf and sauté till onion is tender. Then add ginger garlic paste and turmeric and cook till raw flavor goes away. Add beans , some salt and cook it till they are well cooked by closing the pan with lid. Then add tofu and fry it well. Add fresh coconut, red chili powder and coriander powder, mix well. Cook under medium flame for 5 min with out closing the pan. Now the curry is ready to serve. It goes well with plain rice or roti. Delicious and awesome looking stir fry. Very healthy preparation. Loved the combination and spices in it, looks very delicious. 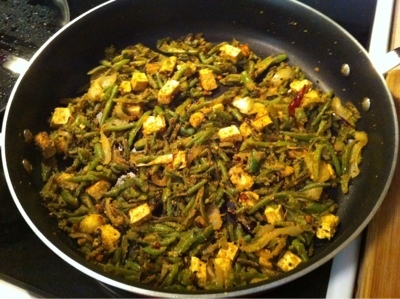 Lovely combination, protein rich side dish!